“Painting is a physical thinking process to continue an interior dialogue,” Amy Sillman states, “a way to engage in a kind of internal discourse, or sub-linguistic mumbling…”. 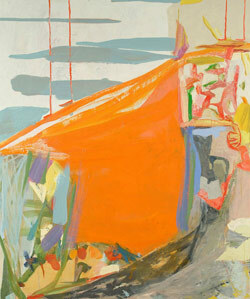 Amy Sillman’s canvases offer glimpses into a subliminal world. 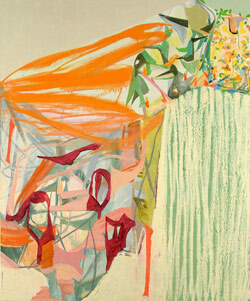 Strangely intimate, her abstractions negotiate a space of both ideas and feelings, inflected with an emotional empathy. “In Cliff 1, a family of mallards is camouflaged between a field of daisies and a bright orange shape that is beginning to dissolve, like a jet’s vapor trail. Striped drapery and a painterly tangle of pastel pinks and baby blues add to the atmosphere of cheery beginnings.” David Pagel. Her paint techniques mirror the convergence of unconscious thoughts: rock rendered with the chalky texture of rubbings, sunset as violent deep orange slashes, birds and flowers with cartoon folly. 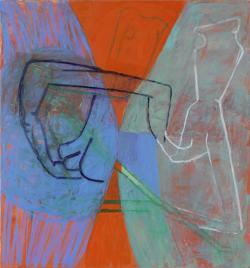 Amy Sillman paints with a sense of intuitive immediacy, attempting to purposefully broach the fragmented territory of affect, of embarrassment and awkwardness, conveying a sense of experimentation and discovery within her pensive gestures. application. “In Cliff 2 the bright orange polygon in the middle of the painting rhymes beautifully with an angled slab of black, some blue cartoon clouds, a messy expanse of loosely painted flowers and a swatch of flowery fabric. Two pairs of long legs, which belong in a kid’s stick-figure drawing of a couple of ducks, descend from the picture’s top edge, suggesting even goofier goings-on beyond its border.” David Pagel. In her study of how to express the totality of something, she becomes absorbed in the semiotics of painterly language itself: thick impasto mixes readily with sly dabs and drizzles, radiant hues and hurried gestures appear in their own space and time. 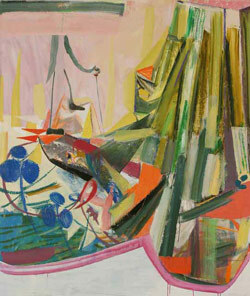 Amy Sillman’s composition suggests private thought that is simultaneously whimsical and brutal. Reminiscent of cubist painting, Amy Sillman’s The New Land creates a landscape of fragments, where shapes and colours converge as independent forms, never quite resolving as a whole. Sillman addresses her canvas with a painter’s heart-felt affection, each gesture becomes a consuming sentiment of expressive absorption. Set against the dalliance of a chalky pink ground, elongated stripes of green congregate with animate integrity, vibrating against patches of electric orange, and off set by contradictory suggestions of spindly flowers and figures. 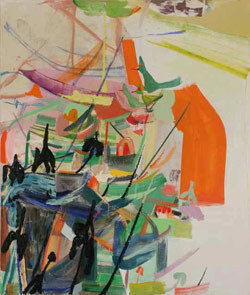 As layers overlap and forms collide, Sillman’s painting descends into a wonder of action and associative reference where bodily experience, memory and perception tangle together. 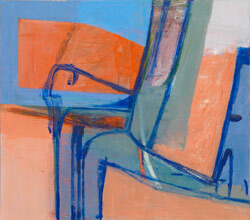 Part of the strength of Amy Sillman’s paintings derives from their conscious use of awkwardness as an aspect of form. Unfolding as a series of spontaneous developments, My Pirate captures the procession of thought, mirroring the meander of the subconscious. Through this free-form approach to painting, Sillman develops a painterly dimension where landscapes emerge as emotive terrains. Formalist structures of lines, shape, color, and shading become signifiers - pensive, blissful, menacing, or frail - each lending their qualities to almost recognisable forms. Attenuate lines become sunbeams and grass, splotches of colour are read as flowers and lakes. Within her complex abstractions, Sillman offers a sense of self: a deeply intimate position in space, time and mind, reflective of a transient perception of beauty and imagination. In Bed, Amy Sillman’s intuitive process is used to convey both loose narrative and psychological uncertainty. With her sumptuous pastel tones tinged with a dirty, dusky pallor, Sillman’s composition doubles as abstract painting and the ambient architecture of a room. 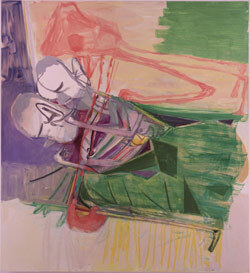 Overlaying her swiping brush marks with delicate lines and precise hard edged shapes, Sillman illustrates two figures huddled in a bed, creepily embraced by a third ghostly presence hovering above. Bed’s pink tones and ephemeral description offer a distinctly feminine sight to sexuality, conveying an intimacy as a totality of self: where carnality and emotional fragility are entwined as apprehensive gesture. In Window, Sillman’s fragmented imagery is exchanged for pure abstraction. Using a limited palette of blues and oranges, Sillman’s blocky planes of colour and thick line delineations create a paradoxical sense of space. As layers of gestural brush marks record her creative process through painterly illusion, the composition suggests an organic architecture, evoking an expanse of internalised psychological perception. Sillman’s highly sensitive style captivates with a disarming resonance, negotiating the sublime traditions of abstract painting with a rarefied and momentous confidence. Blue,James Graham & Sons, New York, NY. The Ballad that Becomes an Anthem,’ ACME, Los Angeles, CA. Affect, Philip and Muriel Berman Museum of Art, Collegeville, PA.